Symptoms of Toenail Fungus – Do YOU Have It? Are you confident that what you have is toenail fungus? Are your toenails thick and/or yellow and you want to know why? My goal here is to talk about what toenail fungus actually looks like and to review the symptoms of toenail fungus in an attempt to aid you in your self-diagnosis so that you can get on to what’s really important…TREATING YOUR TOENAIL FUNGUS!!! For a quick look at the risk factors for toenail fungus OR help in determining who gets toenail fungus, click HERE. Why Are My Toenails Thickening? Toenail fungus, or onychomycosis, is usually pretty hard to misdiagnose as the symptoms of toenail fungus are pretty straight-forward. In fact, most of my patient’s usually come to the office and tell ME that they have toenail fungus! Many have asked around or googled things like, “Why are my toenails thickening?”, “What is wrong with my toenails?” or “Why are my toenails yellow?” and can quickly get their answer on the online platform! 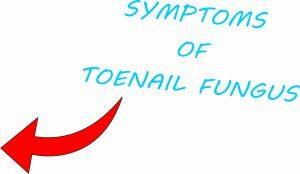 If you don’t have a history of psoriasis, lichen planus or a history of trauma to the nail by a heavy object falling on the nail bed AND you are wondering why your toenails get thick, odds are you are experiencing the symptoms of toenail fungus! The appearance of a diseased toenail can vary based on the time elapsed since the fungal infection began. But, thankful for you, toenail fungus symptoms are pretty straight-forward! Generally speaking, in the beginning stages of infection, one or more toenails typically have a discolored spot that appears within the toenail. This “spot” can be yellow, brown, black or a multitude of colors in-between. Usually, within this initial time span, no pain within the foot or toe is experienced and people usually are not interested in treating such a minute issue. This is the reason that, in most cases, the diseased nail is allowed to progress past this point without treatment being implemented. This is NOT a good thing! In both studies and in my own practice, I tend to see that treatment success is most efficient right here during this stage of the infection. It is essential to stop the infection in it’s tracks right here! Otherwise, you will be looking at a lot longer treatment period. Without treatment, a slow, progressive change in the toenail’s quality and color, which is often ugly and embarrassing, then begins to pursue. As the condition progresses (which it will without treatment), the nail evolves. This evolution over time includes thickening, spreading of the discoloration (yellow or brownish in color) and a brittle or crumbly texture about the nail. If the infected nail is left untreated long enough, increased thickening of the toenail will continue to progress. When the nail advances to the point that it becomes excessively thick and crumbly, it can be difficult to cut or trim. Many people allow the disease to progress to this point. If you have allowed this progression, you may benefit from my post highlighting the proper way to trim thick toenails. In these more long-term cases of toenail fungus, pain and discomfort begins to become an important factor. This pain can be accentuated by the use of tight shoes or when you do get to the point where you decide you have to trim the nail yourself. OUCH! Because of the increased thickness of the nail plate which lays on the nail bed (where the nail plate rests), the nail bed of the toenail can even become sore and inflamed. This is where most of the pain arises from. Eventually, if the infection is left untreated long enough, the diseased nail can become a completely distorted, unrecognizable toenail and the disease can spread to surrounding toenails and/or fingernails!!! GROSS!!!! Once you reach these final stages of toenail fungus, usually, you are at a point where you are trying to hide your feet at all costs. You become embarrassed and self-conscious that you allowed the condition to reach this level. Other, less common, symptoms can also present with fungal toenails. Sometimes, scales with yellow patches will begin to form on the skin around the toenail. Without treatment, a foul (or bad) odor may begin to occur. In addition, in some patients, the fungal toenail begins to loosen or lift up and separate from the nail bed. When this happens, we call this onycholysis and pain usually presents due to this condition. Usually, when this occurs, you begin to feel your socks snagging on your socks when you are removing them. Also, when this symptom arises, you are at increased risk of the nail catching on your sheets or socks and getting totally ripped from the nail bed. Another symptom less commonly associated with toenail fungus includes the presence of dermatophytids. Dermatophytids are fungus-free skin lesions that cause itchiness or rashes in an area on your body that is not infected by the fungus. This phenomena is similar to an allergic reaction. Lastly, you have to consider the wide array of complications that can result from not treating toenail fungus. Click HERE to continue reading about all of the possible complications of toenail fungus. In summary, what you are experiencing is most likely toenail fungus if one or more of your nails portray the following characteristics. Now… all of this, especially the beginning stages, could be considered minor problems (although I have seen patient’s adamant that this could ruin their lives, lol), but… think about the psychological harm that this condition can cause for our younger generation! The nails appear very unpleasant and unsightly. Also, should this infection spread to fingernails this embarrassment can increase exponentially as it is harder to hide fingernails!!! Thankfully, there are successful treatment regimens on the market today… you just have to be careful and choose products that you can trust! My daughter has struggled with some sort of toe infection for over a year. It started with a pedicure that was not sanitary. She was in her first year of college and was not consistent in her treatment. I reviewed your treatment recommendations and of the three, I am thinking that we are going to try the Zeta Clear. I like the idea of the oral spray in addition to the topical treatment. Can the Zeta Clear be used with prescription remedies? Perhaps ZetaClear is the solution we are looking for. Hey Wendy! I am so sorry that your daughter is struggling with this! Sadly, foot spas are a very common place that we see the fungus (onychomycosis) contracted. I am thrilled that you reviewed the three products that I recommend for the treatment of toenail fungus and decided to go with one. That is the first step! Because of the natural ingredients in ZetaClear it can absolutely be mixed with topical prescriptions. However, the only bad part about mixing treatments is that it will be unclear which actually works to clear it up! When I first discovered ZetaClear (and the two other products that I recommend as well), I did have patients mix it with prescription medications! However, when I realized that I had begun to see such a quick and definitive improvement for patients, I knew that it was the ZetaClear… prescriptions alone had never worked as quickly as what I was seeing! I am a firm believer in all THREE of the products that I recommend, including ZetaClear… I would not risk my reputation if it were not as good as what I am stating! After your daughter begins her treatment with it, please come back and comment on her results with this product! I cannot wait to hear the excitement in her responses! Your post got my attention as after visiting a new nail salon in my town I have noticed a few weeks later that my nails are not the same. Not sure if it is fungus or a different type of infection but of your three recommended treatment options, I believe that I would like to try the ZetaClear for sure! It looks like the ingredients of ZetaClear are very beneficial and I am glad that you shared it with us as I have never heard of it. If I have a cut though should I wait and not use ZetaClear? We go to the beach a lot lately so wasn’t sure… Thank you! Hello Lena! Nail salons are a very popular source of fungal infections and I hate to say it, but this is likely your case! If you will read my page Why Should You Treat Fungal Toenails, you will see the importance of starting treatment NOW! It will only get worse! ZetaClear is perfectly fine to use even with a cut! That is one thing that I love about it! It is all natural ingredients and stimulates healthy nail and skin regeneration! So… if anything, it should aid in the healing of the wound! So… get that fungus under control!!! You should not wait!!! Hello Othello! Thank you for visiting my site! I am so sorry that you are suffering from Athlete’s Foot! I recommend an amazing product that will for sure combat this annoying, and sometimes painful, condition. You can read all about this “miracle balm” by clicking HERE! It is the best of the best at curing Athlete’s Foot. Also… the reason that your current treatments may not be effective is because you are consistently exposing your feet to the fungus via your shoe gear! I have a great article on how to solve this problem! It is all about a product called a shoe sanitizer! Feel free to click HERE to read the article! I truly believe that this is probably the reason that you are having difficulty getting this under control! SWIM has something on the big toenail, one corner of it (like 15-20%) is a dark brown and thicker than the rest of the nail. It doesn’t hurt, it doesn’t itch, it’s not getting any worse nor is it getter better. It’s been like that for several years. Do you think that this could be toenail fungus or should I have it looked it? Maybe its just nail growth? Thank you for all the information you put here. In regards to the discoloration that you are experiencing, this is not normal. Your toenails should be clear, uniform in thickness and free of ridges and/or lines. Without a thorough exam, I am unable to speak definitively, but this very well sounds as though you are experiencing a toenail fungus in the beginning stages with the darkness and thickening that you speak of. Toenail fungus usually does NOT itch. It is very common for the fungus to lay dormant and not worsen for years and then as co-existing health conditions arrive, it will slowly progress. I have included a link to my post on Why Should You Treat Fungal Toenails? and hopefully this will give you more insight into how to proceed. Should you decide to move forward with treatment, I would definitely recommend one of three products… depending on your style of treatment preference! You can read more about these products in my Product Reviews post! Don’t waste your money with anything else that you see… typically they do not work! I hope that I have helped and want you to know that I am more than happy to answer any other questions or concerns. Have a great day! Thank you for such an informational article. I am not sure about my pinky toe as it isn’t discolored that I can tell, but it does have a dark mark on it… as if I were removing polish and missed a spot. I don’t wear polish but just as an example. I might have to now further investigate to see if I might need some kind of medicine to put on it before it gets worse. I am glad your here to provide this type of insight. I love wearing flip-flops and sandals (weather permitting of course) and I’m sure that others who love to do so as well will admire your content especially due to the experience you have treating these issues. Thank you again for sharing your knowledge and know how. Hello Lee Ann. I am glad that you found my article useful. I hate to say it… but USUALLY toenail fungus DOES begin with a small area of discoloration (such as your pinky toe). The good news is, though, that if you treat this condition quickly while it is this minor, usually you will see very good results very fast! I have three different products that I can recommend depending on exactly how you prefer to treat it. I have included the link so that you can read about these products HERE! I hope that this helps. If there is ANYTHING that I can do to be of any further assistance, please feel free to comment below and I am more than happy to help! I never knew exactly what nail fungus looked like. I tend to always have my toenails painted since I wear flip flops a lot and think my feet look “prettier” with polish on. However, there have been times after I take off my nail polish that I see yellowish, flaking nails, it’s definitely ugly looking. Based on this article, I’m guessing that it’s not necessarily nail fungus, but more of staining and damage to the nail from having on polish too often. Do you recommend keeping your nails polish free for awhile to keep them healthy? Hey! Thanks for your comment and thanks for visiting my post discussing the symptoms of toenail fungus! To answer your question… I do recommend giving your toenails a break after using polish. I usually tell people that following a pedicure, it is ok to leave the polish on until it starts cracking. After cracking ensues, remove the polish and allow the nails to breath for about a week prior to re-polishing. While our toenails are hard… they are also permeable. This means that substances can soak into your nail. In addition, the pigment contained within the polish can absorb into the top layers of the toenail and dry it out, thus setting you up to develop fungus and other conditions such as yeast, bacteria, mold and mildew! In addition, I also recommend using an antifungal nail polish. I have attached a link to the specific brands that I recommend HERE. I hope this helps! Please let me know if you have any additional questions! Have a great day!!! I do not have toenail fungus, but I have had a trauma to a big toe where a tree fell on it and the Nail has thickened. Is there any cure for this or is just one of those things I will have to live with? Oh by the way nice website and funnily enough I used to do medical transcription for a podiatrist. It is funny how life is filled with strange connections. I am so sorry to hear about your big toe. Unfortunately, when an incident occurs that results in scarring of the nail matrix (which forms the toenail), a thick toenail is the result. There is no magic cure for this condition as it is simply due to scarring. However… you should be able to file the nail down in thickness to the point where it almost appears normal. One of my absolute favorite tools to do this is the Medicool Turbofile Electric Nail Filing System. If you click HERE, it will take you to my personal review of this product.